Construction techniques for fabric moulds use standard construction tools and fasteners, and the methods and materials are all extremely simple. There are a few special tricks that are unique to handling textile moulds, but these are easily mastered. Although you can cast concrete in nearly any textile, the fabrics most often used in construction are the same kind of material used in cheap "poly-tarps" (the kind used for sand bags or to cover a wood pile). These polyethylene or polypropylene woven fabrics are the cheapest textiles in the world, yet they are very strong, will not propagate a tear, and nothing sticks to them -- including concrete. Introduced commercially in the mid-1980's, and available world-wide, these textiles provide formworks that are strong, inexpensive, reusable, ecologically sound, and robust. They are produced as "Geotextiles" in rolls up to 5.3 m (17.5') wide. Uncoated woven geotextiles act as filters, allowing air bubbles and excess mix water to bleed through the fabric mould-wall, producing an extremely fine finish and a stronger and more impermeable Concrete surface (references for increase concrete quality can be found under the Resources tab). The applications and techniques shown on this website all use simple flat sheets of fabric -- no tailoring required. Although sewing machines can certainly be used, they are not required. Nearly all the techniques developed and described here use common construction tools and fasteners. ​The great simplicity and economy of these methods makes fabric moulds suitable for construction anywhere in the world, in both high- and low-capital building cultures. The best way to learn about fabric formwork construction is through The Fabric Formwork Book, the first comprehensive guide to the subject. This website focuses, almost exclusively, on the work of Mark West, though much of this work was done with his students of architecture and other research associates. Works of others, when shown, are separately credited. Columns moulds are among the simplest fabric formworks to construct. In its most elementary form, a flat sheet of fabric, closed as a cylinder and held vertically, retains a vertical column of wet concrete. Such moulds use hundreds of times less material than conventional rigid formworks. ​Fab-Form Industries, in Surry BC, Canada, sells fabric column moulds under the ​Fast-Tube product name. Reinforced concrete beams can be easily formed in a flat sheet of fabric suspended horizontally as an open trough. This basic configuration is open to many different variation that can shape the geometry of the beam for greater structural efficiency. This can lead to significant savings in concrete, reinforcing steel and consequently deadweight. Technical civil engineering articles on efficiently shaped fabric-formed beams can be found in the Fabric Formwork Resources tab. Record of the first 12m (40') fabric-formed reinforced concrete beam cast in 2003 (see first images in the slideshow below). The mould used a single flat rectangle of polypropylene geotextile. The most efficient beam form is the truss; it selectively places material exclusively along the lines of tension and compression force in the structure. Trusses are commonly available in wood or steel, but are rarely seen in reinforced concrete due to the complexity of truss mould construction (so many small pieces and joints!). Truss formworks are extraordinarilly simple to build using flat fabric sheets. Some examples are shown below. The most structurally efficient way to resist a force is through tension (pulling). The second most efficient way is through pure compression (pushing). ​Tension and Compression mirror each other in both sense and geometry: the pure tension geometry of a hanging chain creates a pure "tension arch"; once inverted, the same shape creates a pure compression arch. This deep natural symmetry between tension and compression provides one of the most beautiful and elegant uses of fabric formworks. A textile can only resist tension, while concrete is only used in compression. A structurally resistant double curvature shell shape is easily formed when concrete is held against a hanging sheet of fabric. If this tension-formed shell is inverted, it will act as a compression-resistant shell. Some examples of fabric-formed thin-shell structures are illustrated below. The pioneers of cast-in-place fabric-formed walls are Kenzo Unno (Japanese architect and inventor of URC walls), and Sandy Lawton (builder/designer from Vermont, USA). The photographs collected here are largely their work. 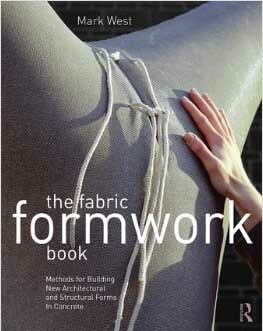 ​Chapter 9 of The Fabric Formwork Book, provides more detailed descriptions of how to build fabric-formed walls. Click below to to download an article on Kenzo Unno's fabric-formed wall techniques, or to see a short video of URC construction in action. Video shows external vibration of the concrete. ​Translucent woven polyethylene fabric let's you see the concrete inside the mould. Fabric wall moulds are extremely efficient, using hundreds of times less formwork material than conventional rigid formworks. Flat portions can be formed at any time, simply by holding a rigid panel against the fabric mould-wall. Concrete panels, for wall or floor structures, can be pre-cast in horizontal fabric moulds. Supports beneath the fabric sheet can be altered to produce different designs from the same sheet of reusable fabric, much like a printing press. Fabric-cast panels can, themselves, also be used as moulds to produce invert-geometry panels, the convex bulges of the original cast, now mould, producing concave shell-like geometries. Fabric-formed foundations are the invention of Richard Fearn, CEO of Fab-Form Industries. Fab-Form sells foundation moulds under the trade name Fast Foot. The advantages of forming concrete foundations in fabric include, lower material, storage, and labour costs, elimination of construction waste, and the waterproofing beneath the foundation. Certain applications, such as stepped footings or foundations in moist environments, are particularly advantageous. Because the stresses inside all structures follow naturally curved paths of force "flow", and because flexible moulds can easily form curved volumes, fabric formworks have a natural ability to simply and economically form concrete structures into shapes that follow the curved force flows inside them. This can result in lighter, more efficient reinforced concrete structures that require significantly less concrete and steel than the prismatic, uniform-section shapes of conventionally formed concrete structures. A short primer on curved force flows in structures is provided in Chapter 3 of The Fabric Formwork Book, and examples of efficiently curved structures can be found throughout the book. My own discovery of fabric-formed concrete began in 1987 through a sculptural practice. The uncanny similarity between bodies and fabric-cast concrete forms, stems from a fundamental co-incidence: phenotypes from both realms are made of fluid-filled membranes. In the first instance, from pressurized cells walls to the pressure of pumped blood. In the second instance, from the plasticity of wet concrete pressing against the skin of its container. This heavy, wet, pressing meets a mirroring resistance in the tension membrane mould, invariably giving an otherwise "dead" material the strange appearance of life. Instead of thinking about these things strictly in terms of "form", I tend to think about them primarily in terms of action -- the result of a force or energy flow, held in space and solidified.